One side of Redwood Rd. crossing at Proctor School. Proctor School Crosswalk: As noted in a previous post, the crosswalk across Redwood at Proctor school will get a Rapid Flashing Beacon, as early as this summer or as late as Spring 2016. Bulb-outs on either side of the crosswalk will be constructed by Spring of 2016. A “No U Turn” zone is in the final approval stage for Redwood Rd. in front of Proctor school and expected in the next couple of months. PWA is currently gathering the necessary data to substantiate the speed display signs for the approach from the golf course. Speed humps, raised crosswalks or “bot dots” are not being considered due to the volume of the road and the 24/7 sound volume from bot dots in a residential area. We asked about the possibility of a pedestrian traffic light (always on green for cars on Redwood Rd. unless somebody wants to cross) instead of flashing lights. One of these exists in front of San Lorenzo HS at Lewelling. Art is looking into this as a possibility, but would need to prove a very high volume of pedestrian traffic to substantiate it. Proctor Road Sidewalks: There is lots of competition for sidewalks in Castro Valley and this is one of a short list of priorities. We asked on this call and in follow-up email conversations about how to make progress on clearing overgrowth on unimproved sidewalks. We learned that there is a question now as to who would be responsible for the clearing. It may be the case that if these sidewalks are considered “routes to school”, it may be PWA who is responsible, rather than the homeowners. Art is going to check into this and get back to us. Lake Chabot Rd. Bike Lane: The current Lake Chabot Rd. “edge line” will become a fully painted and marked bike lane at the end of construction. Art did not have the exact date of completion and will let us know. Lake Chabot Park Entrance Crosswalk: As noted in my previous post, a Rapid Flashing Beacon will be installed here. We asked Art about shifting the existing crosswalk to instead cross through the adjacent island in the middle of Lake Chabot Rd. in order to create two separate crosswalks. This would allow pedestrians to wait on the island between crossing each side and allow cars to flow through the unoccupied side. Art said he was concerned for the safety of pedestrians in a crosswalk that is shifted away from the primary intersection, as drivers exiting the park might not expect a crosswalk there. He is going to consider this option. We also asked about bulb-outs at each end of the crosswalk. The current funding for the Rapid Flashing Beacons at this location would not cover the cost of bulb-outs, but Art will consider this request. Speed Feedback Devices: PWA must gather data and make a case for the need of any Speed Feedback Devices based on several factors, like a transition from rural to urban, excessive speeds, etc. The location on Redwood Rd. 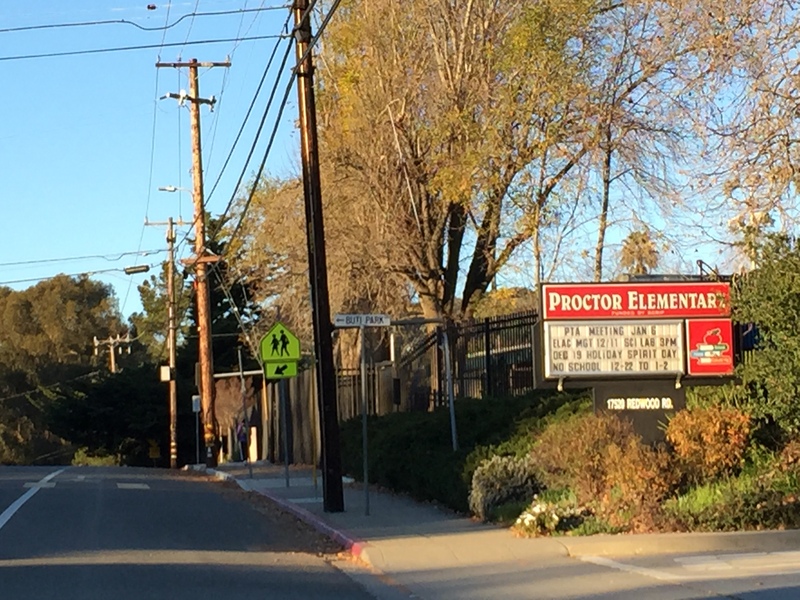 coming from the golf course to Proctor school is their number one priority on this list, with the approach from Fairmont to Lake Chabot’s park entrance next in line. We are pleased that Art has been very responsive and is open to collaboration. We will continue to work with him to ensure all projects move forward. I’ll have a second update this week about the other topics covered on this call. If you have any questions or would like to share your ideas, needs or concerns, please email us at BikeWalkCV@gmail.com.